photo: Ting-Jhao Jian goes up for one of his 10 points that went along with his team-high 10 assists in the win tonight over Shoreline. photo by Rick May. Bellevue College men’s basketball got back on the winning track tonight with a 93-80 win over Shoreline tonight at Courter Family Athletic Pavilion. Bellevue jumped out to a 47-35 lead at halftime as the Bulldogs received quality play in a number of areas from different players. Kai Warren sank 10-of-11 from the free throw line and led BC with 18 points. Curtis Walker added 12 points and led the ‘dogs with 10 rebounds while Ting-Jhao Jian had a team-high 10 assists to go along with 10 points. 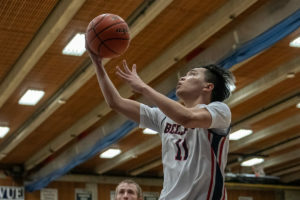 The Bulldogs capitalized on Shoreline’s fouls, as BC outscored Shoreline 25-2 from the free throw line for the game with a free throw percentage of 74%. Bellevue is now 2-2 in league (11-6 overall). The squad travels to Edmonds this Wednesday January 23 for a 7:00 tipoff.